(image produced via planetarium software - Starry NightPro). View shows relative outer Planet positions on 5.Jan.02. 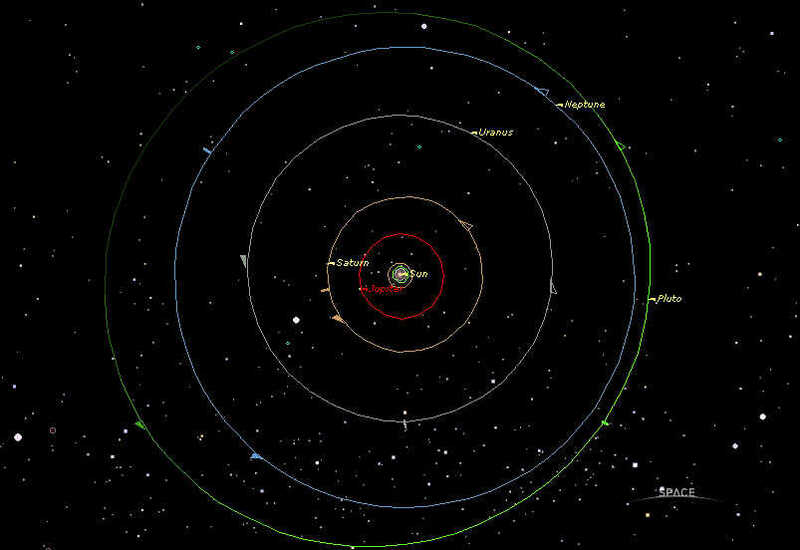 The inner red orbit is Jupiter at a distance of 778 million kms from the Sun, or about 5.2 AU (AU= astronomical units, where the distance from the Earth to the Sun is 1 AU). Note the slightly elliptical nature of the orbits, the closest point to the Sun is marked with a tick. An half-arrowhead indicates directions of orbits from position viewed. Click on picture for image of positions and orbits of inner planets.